Tracks from this album have haunted my MP3 player over the last couple of weeks; seemingly turning up every time I press random. This could have been irritating and annoying if they hadn’t been so blooming good and fresh. 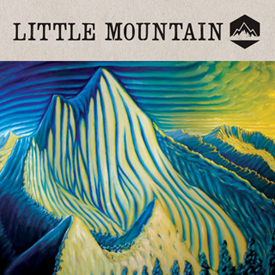 While Little Mountain have musicians listed on the album sleeve; everything revolves around singer Amanda Zamola, Steve Forshaw (vocals & guitar) and band founder Ross Godfrey who was once in a band called Morcheeba who skirted around the Trip-Hop scene of the 1990’s. Opening track Giving It Up is a nice taster for what follows as it features Zamola and Forshaw harmonizing over a modern folk-rock sound; which with hindsight may (or may not) be influenced by Godfrey’s Trip-Hop background; even though the guitar break in the middle is pure West Coast. While I definitely like the album as a whole; when Amanda Zamola takes the lead the songs leap to another level; as she has something of an ethereal voice, akin to a young Stevie Nicks. What We Gonna Do and Tractor Beam especially showcase her talents and have me desperately hoping for more of the same. I’m certainly not averse to Forshaw’s voice; far from it, as on the poetically wordy Even More and the album closer Almighty Love his slight rasp and expressive voice conjures up memories of some of my favourite singer-songwriters of the 70’s and 80’s. For a debut album it’s a lot better than I’d have expected, with several songs already earmarked for my Holiday Mix-tape (for my I-phone).